It's a small world. 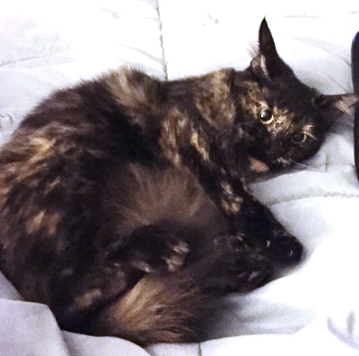 Several months ago, I noticed a post on the Lost Pets of Baton Rouge Facebook page for a cat named CeCe that had become lost when it escaped in the parking lot of the veterinarian's office. CeCe's owners were out of town and a relative was taking care of the cats. When the caretaker noticed that CeCe was having a health problem, she took her to the vet right away. When she arrived at the vet's office, CeCe escaped and ran off. All attempts to find her failed. After reading that post, I felt compelled to go help look for her. I felt that there was a good chance that CeCe could have climbed a tree, and if she had, I wanted to help find her and bring her down. I was familiar with the area, and there was a creek that ran alongside the vet's office with a large area of wilderness containing numerous trees. 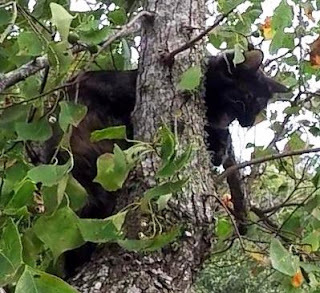 There were hundreds of other places for a cat to hide there as well, and it would take more than just one pair of eyes to find her. I walked up and down the creek looking in every tree and every hiding place I could find. I did not find her. 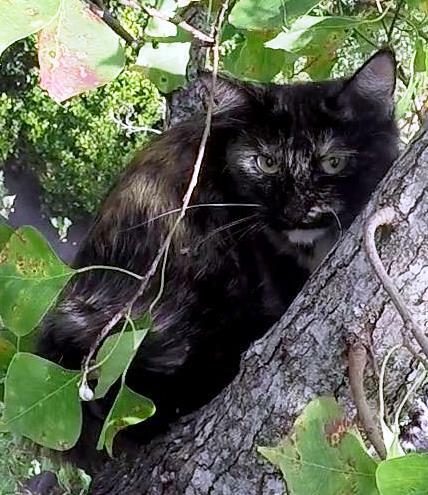 In the civilized area behind the clinic, I looked in every tree, under every bush and even in the storm drains, but again, I could not find her. After a lengthy but fruitless search, I gave up and reported my attempt to the cat owners on the Facebook page. I kept checking that page for an update hoping that the cat would be found, but sadly, she was never found. 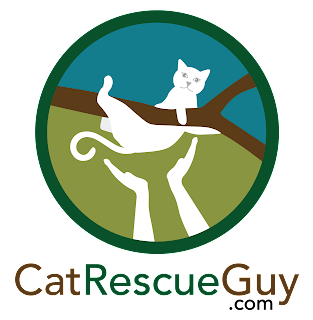 Today, I arrived at Paul's house to rescue his one-year old cat named Paisley. I did not know until Paul told me after my arrival there that CeCe was his cat. Not only that, but CeCe was Paisley's mother. I never could find CeCe, but now I could at least rescue her look-alike daughter, Paisley. Paisley is a long-hair tortie, and she was stuck about 35 feet high in a volunteer tallow tree that was growing close to the back corner of the house. She was very near the top of the tree, and a top portion of the main stem had broken off long ago leaving me with few safe places to attach my rope. To reach her, I would have to climb above my original tie-in point using multiple lanyards to secure myself. Based on what Paul had told me about Paisley's demeanor, I was not expecting her to be friendly, but I was pleased to see that at least she was not terrified of me. She stayed mostly in place while I climbed up to her even though she could have climbed higher on skinny branches beyond my reach. Still though, she was stressed by my presence, so I spent some time trying to calm her down and help her learn to trust me. While I did not expect her to be interested in food, I decided to offer it to her anyway at least to help her regard me in a friendly light. As expected, she did not eat any food, but she did show some interest in it. I positioned myself closer to her to get within reach. I reached my hand out to her, and she calmly sniffed it. This was a very good sign. I did so again, and this time I touched her head. She was receptive to my touch, so I spent some time petting her and getting her to trust me. Now I knew I could scruff her into the bag, so I prepared myself for that. When I scruffed her, she took it very well and did not struggle or complain as I began to pull the bag over her. But then she changed her mind and decided she did not like this. She managed to poke her face and a front leg out of the bag, and she snagged a claw on my shirt and then pierced my thumb. I got her fully back into the bag quickly, but she felt betrayed and was not happy about this. That's okay with me though. I had her safe and secure in the bag, and all I needed now was to bring her down. After she was inside, she drank a lot of water and ate some food. Then she stuck to her people family like glue. She was afraid to let them out of her sight, but otherwise, she is doing just fine. They sent me this picture of her snuggling against them afterward. Paisley is fine, the family is happy. I feel great.